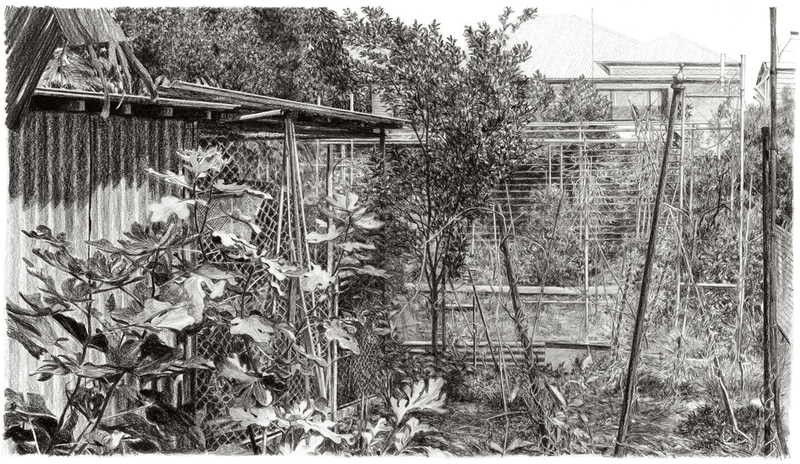 My work “Maria’s Garden” has been selected as a finalist in this years Adelaide Perry Prize for Drawing. The Adelaide Perry Prize for drawing is a $25,000 acquisitive art award and this year attracted over 600 entries. The exhibition opened in Sydney on 26th February when the winner Andrew Browne was announced – for a beautiful and thought provoking work. Standing on my toes at our back fence, I sometimes chat with my neighbour Maria. I love her garden, the chaos at the back, the organized garden beds, and the bright red geraniums that ring her clothesline. Maria and her husband came from Italy after the war and with many other European migrants, they settled in our inner city suburb New Farm. Maria is over eighty now and finds the garden harder to maintain since her husband died a year ago. I have learned more about her and her garden since she has allowed me to sit and sketch. The possums are a problem and plastic bags over ripening vegetables are her first line of defence. There is so much to draw, so much evidence of her and her husband’s life over the last sixty years.